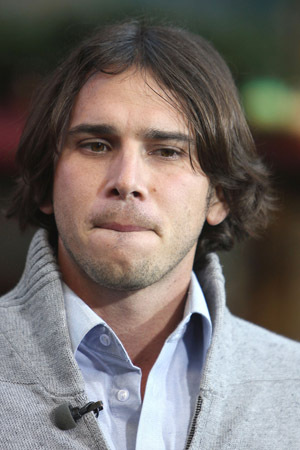 Ben Flajnik scrambled to explain some scandalous photos during last night’s After the Final Rose ceremony. Is he telling the truth? We don’t think so. Is newly engaged Ben Flajnik a low down dirty dog? It looks like it — and he’s not afraid of lying to cover his behind. The new fiancé of Courtney Robertson told host Chris Harrison that he’s never cheated on his final rose winner since the show wrapped in November. “On my father’s grave, I haven’t kissed another woman. I haven’t hooked up with another woman. I haven’t cheated on Courtney. None of that,” the Josh Groban lookalike told Harrison. However, US Weekly photogs snapped the reality star in compromising positions with several ladies in San Francisco in February. “Ben did not seem to care who saw him, considering his status on a prime-time reality show about finding true love,” a spy told the magazine. “Those are friends from San Francisco. Those are past photos,” The Bachelor star said of the incriminating pictures. We don’t know about you, but we don’t make out with our friends when greeting them or grab their butts. Maybe Flajnik’s circle is different? Maybe it’s because he’s not really with Robertson anymore? “We were essentially broken up,” he told Harrison. “We had a talk and decided it’s not healthy with all this negative energy,” he added, referring to his chosen woman’s controversial, conniving behavior on the show. This all happened around Valentine’s Day, the same time the infamous photos were snapped. Ultimately, they decided to give their relationship another go — and he put the ring back on her finger while cameras rolled. Will it last? We give it a month, two at the most.